It's your turn to define how digitalisation will transform the Aerospace Industry in a near future! Be creative and think out the box! 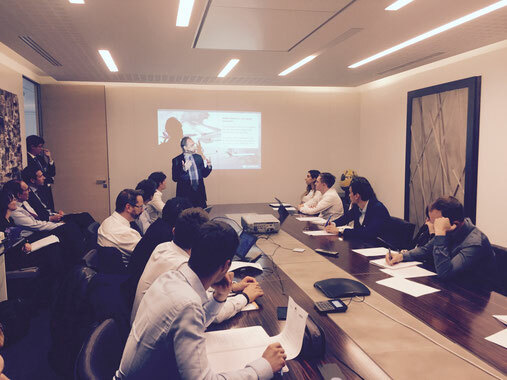 In the framework of the 2016 USAIRE Student Award created 11 years ago by Michel Dubarry, President of Rolls-Royce International in Paris, a Digital Seminar was jointly held last Wednesday 6th July by Dassault Aviation and Airbus Group. Organized by Rolls-Royce, the Digital Seminar was the occasion for the 15 finalist teams to get some first-hand information from major stakeholders of the aerospace industry, as well as informal networking opportunities. Following a private visit of the Virtual Reality Center at Dassault Aviation, the students were invited to take part to a Digital Conference that gathered six high-level speakers at Airbus Group: Marc Hamy (Vice President, Head of Air Transport and Public Affairs, Airbus Group), Bruno Stoufflet (Vice President R&D and Advanced Business, Dassault Aviation), Nick Ward (Predictive Equipment Health Management, Rolls-Royce), James Kornberg (Director Innovation, Air France-KLM), Col. Arnaud Gaviard (Plan and Policy Department, Head of Capability Development, French Air Force Staff) and Nathalie Domblides (Deputy Chief of Staff, DGAC). Thus the finalists had the chance to benefit from valuable presentations and discussions that will be a substantial asset in the preparation of the final selection round. For the record, their 10-page research on “How will digitalization transform the Aerospace Industry in a near future?” is due on September 4. The award ceremony will take place on November 25 on the occasion of our Thanksgiving dinner. Laureates 2016 at the Thanksgiving dinner with Mr. Eric Trappier (CEO Dassault). Congratulations to the 2016 Winners of the Usaire Student Award! 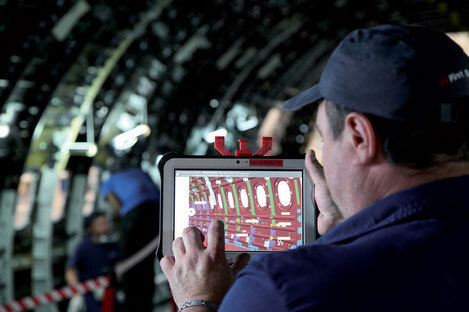 How digitalization will transform the aerospace industry in a near future? This topic attracted many outstanding students! The competition collected 43 submissions from 26 European universities and schools. 71 students were involved in the first phase of selection: 28 per team and 15 individual candidatures. At the end of the first selection round, 15 candidatures were shortlisted. On Wednesday 6th July, the 15 finalist teams had the great opportunity to attend the Digital Seminar organized by Rolls Royce and held by Airbus Groups and Dassault Aviation (with the participation of Air France-KLM, French Air force and DGAC), to get some first-hand information about digital transformation from major stakeholders of the aerospace industry, as well as informal networking opportunities. This event was a substantial asset in the preparation of the 10 page-research. Pierre-Alain Goujard, already graduate from Saint Cyr in 2004, and now pursuing an Advanced Master in Aviation Management at Ecole Nationale de l’Aviation Civile (ENAC) and Toulouse Business School (TBS) was awarded the first prize. The second prize has been attributed to Caroline Dumortier and Victor Huftier from Ecole Supérieure des Techniques Aéronautiques et de Construction Automobile (ESTACA). 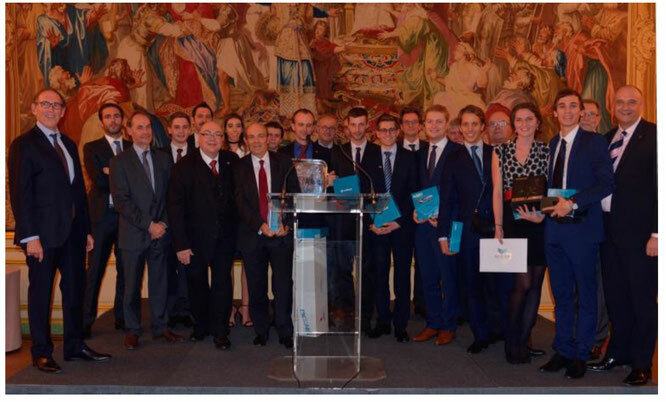 Tanguy Bombrun and Alexandre Doridot, respectively from HEC Paris and Ecole des Ponts-HEC were awarded the third prize. The fourth prize has been attributed to Sarah LAOUTI (Warwick Business School-HEC) and Markus SODAR (University of West England). The USAIRE Student Award Ceremony held on November 25th 2016 at Le Cercle de l’Union Interalliée (Paris) during the USAIRE Thanksgiving Dinner. It’s in this prestigious framework that Winners received their prizes directly from the sponsors (Singapore Airlines, Rolls Royce, Boeing, Air France, Transavia, Panasonic, Air&Cosmos, Aviation Sans Frontières, Michael Page, USAIRE). 250 persons attended the ceremony and among the guests: James Kornberg (Director Innovation, Air France-KLM), Col. Arnaud Gaviard (Plan and Policy Department, Head of Capability Development, French Air Force Staff) and Nathalie Domblides (Deputy Chief of Staff, DGAC). 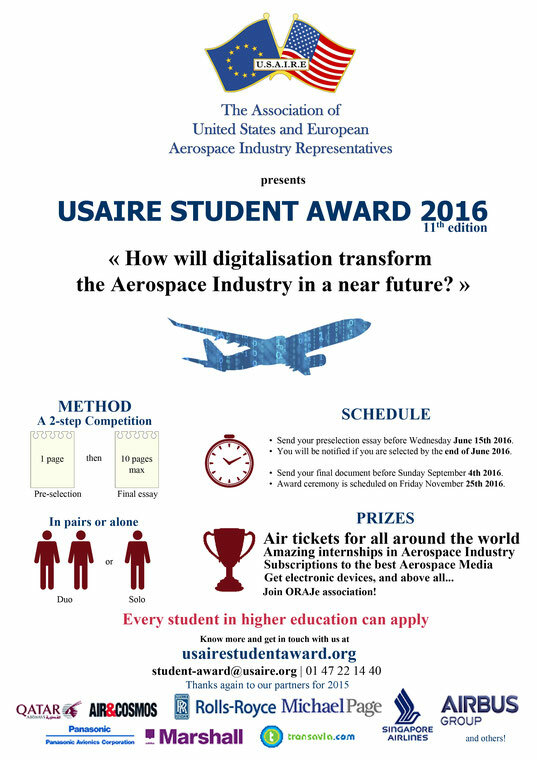 Eric Trappier, CEO of Dassault Aviation and guest speaker, revealed the new topic for the 12th edition of the USAIRE Student Award: “How Digitalization will reduce costs?”. He explained to the audience why connecting systems, products and services will be the issue of tomorrow and how digitalization of products and production will change the face of product life management (PLM). Finalists are now members of ORAJe. This alumni club is growing every year (more than 150 members), and provide opportunities for alumni to build a network and remain connected to USAIRE. The organization help to promote and elevate the stature of the USAIRE Student Award and encourage career and professional development.